Work has begun on Europe’s two largest-ever butane river tankers, at the VEKA shipyard at Lemmer (Netherlands). Each vessel is around three times the size of today’s typical Rhine barges. he vessels – the result of a working partnership between INEOS Trading & Shipping and Imperial Logistics – will transport gas from the world’s largest butane tank, currently being constructed at the Oiltanking Antwerp Gas Terminal (OTAGT) in the Port of Antwerp, Belgium, to the INEOS cracker site in Köln, Germany. INEOS, Imperial Logistics and VEKA have worked closely together on the design, planning and construction of the state-of-the-art vessels, which will measure 110 metres long with a beam of 17.5 metres, and have capacities of 3,024 tonnes of butane carried in six tanks. Each of the barges will be powered by three engines. The new tankers will also have increased collision protection, and their auxiliary power units will have full sound insulation to comply with noise regulations at the unloading points. The two new vessels are among four on order by INEOS and Imperial Logistics; the other two are slightly smaller at 110 meters long x 15 metres beam, with two engines and capacities of 2,428 tonnes of butane. 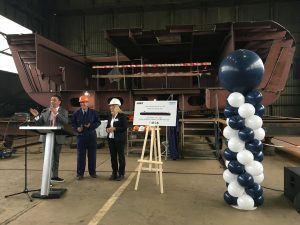 Senior executives of INEOS and Imperial Logistics were among over 40 VIP guests attending the keel-laying ceremony at VEKA’s Lemmer yard. VEKA Group is a dynamic, privately-owned company that has become an international player in the shipbuilding industry in its 29 years of existence. With several shipyards in the Netherlands and abroad, the company specializes in the development, construction and sales of a wide range of ships. To date, 1,000+ vessels have been built by VEKA. The construction and outfitting activities are carried out in accordance with ISO 9001, ISO 14001 and OHSAS 18001, and take place under the supervision and approval of the classification bodies.